Rachel Bach is a pseudonym of Rachel Aaron. She received a degree in English Literature from the University of Georgia in 2004. She lives in a 70s house-of-the-future in Athens, GA with her husband, an overgrown library, and her small, brown dog. Find out more about the author at Rachel Aaron’s website. HERE’S OUR RACHEL AARON PAGE. Devianna Morris is the most ambitious mercenary you’ll ever meet. 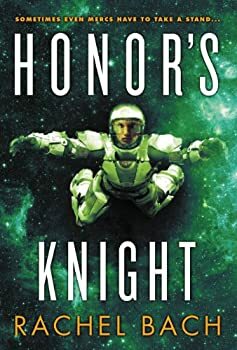 Her life’s goal is to join the Devastators (the super-elite king’s guard) and the only way to get there fast is to sign on to the security team of the merchant ship called The Glorious Fool. Devi doesn’t know why The Glorious Fool is so dangerous, but she knows that it manages to kill just about every member of its crew, so just surviving for a year should be enough to bring Devi to the attention of the Devastators. At first Devi is not too impressed with her new job. Her security partner is brave and competent, but he’s a jerk. The captain’s strange chess-playing daughter is aloof and unfriendly. Devi’s roommate is a loony hippie. The ship’s cook is totally hot, but he is not responding to Devi’s advances in the normal way, which is annoying, not to mention embarrassing. This series is best described as romantic space opera. It’s light on the science (it doesn’t even try, in fact) and heavy on the relationship drama. For me, the best aspect of the story is the mystery. 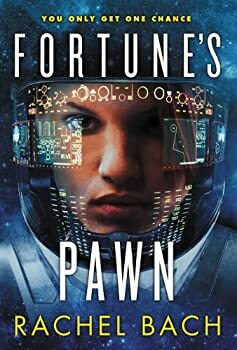 Our protagonist, Devi Morris, has gotten herself into a strange and dangerous situation and though I don’t care about her romance — as I explained in my review of Fortune’s Pawn, the “love” doesn’t feel real to me — I am interested in where the story is going.